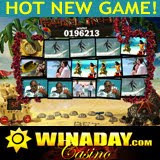 WinADay.com has just launched its most exotic new online slot machine ever. The new Tropical Treat is a 50-payline slot machine with free spins and amazing fun-in-the-sun video graphics. Like all games at WinADay.com, it’s one-of-a-kind and only available at the whimsical online casino which is operated by Slotland.com, one of the oldest and most popular slots and video poker sites in the world. Adorned with images of sun, surf and tropical flora and fauna, players click an animated starfish to spin the reels. Colourful animated butterflies flutter across the screen as they choose the amount to be wagered (from $.01 to $4 per payline). Buttons on a sand castle are used to choose the number of paylines to be played. The new game has a Wild symbol that substitutes for any other symbol and a Double Wild symbol that doubles the pay out. Three Free Spin symbols extend game play with ten free spins. The Free Spin symbol also multiplies wins by up to 5x. They are Scatter symbols and do not have to be on one payline to trigger the bonus spins. Like all slots at WinADay, the new Tropical Treat is tied to the site’s progressive jackpot. Five Compass or Globe symbols on a payline, with a minimum $5 bet, wins the jackpot which is currently nearly $200,000. The progressive jackpot at WinADay is won, on average, every five or six weeks but since it hasn’t been hit since the end of March when a player won $224,420 playing the Reel De Luxe it has reached a near record breaking level. The next jackpot win will be one of, if not THE biggest ever. The game developers at WinADay have been busy this spring launching a new game every month. In March it was the new Leprechaun Luck slot, a 5-reel, 31-payline game featuring Wild and Double Wild symbols and bonus games. Just last month it was Slot 21, a slot machine based on Blackjack. The unique casino site now has -15 whimsical games: ten unique slot machines, four video poker games and Roulette 5 which combines slots fun with the thrills of Roulette. They’re all instant play, no download games that are available only at WinADay.com.